SunquestVacations is selling some last minute seats on their charter flights (which are actually operated by WestJet) from Winnipeg to Jamaica for a crazy price of $258 roundtrip after taxes. 3. Search for a flight from Winnipeg to Montego Bay (MBJ), departing March 16 and returning March 23.
winnipeg, ywg, montego bay, jamaica, mbj, caribbean, western caribbean and flight deals. 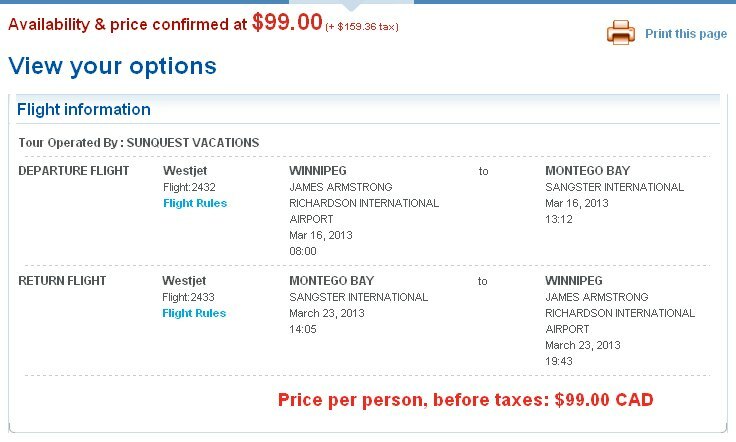 One Response to "Winnipeg to Jamaica | $258 roundtrip after taxes"
i passed this deal on~everyone I told was in shock // they didn't believe me! ...I would've jumped at this chance!~ the great opportunity that I was hoping for.